Everything! The location is amazing! Close to the center of Fira, but still quiet. There are not many stairs to walk, which is way more important than I thought before I went. George is very nice and helpful. The room is very spacious and view is perfect! Bed is also very comfortable. If you want to stay close to town with the Best View, stay at Nonis Apartments. The rooms are beautiful and clean, the bed was so comfortable. The service is wonderful, George was very welcoming, helped us with our luggage, pointed out the places that we must visit and also helped organize an ATV which was brought to us. Town is pretty close, walking distance so the location is also very good! No is will get 10 points ++++ Thank you we will definitely come again. Wonderful view, handy location (3 Minutes walk to the bus station) and very helpful and friendly guests. Unfortunately, due to the fact that the other houses are so close, most of the time you have to keep the shutters close :). A good address I would recommend though. The staff was great, very helpful. The owner gifted us with a nice bottle of wine when we ran into him and chatted on the patio. Happy to recommend this establishment. Great location n the heart of Thira/Fira, yet quiet and peaceful. Most wonderful view in the world! If you’re not sure just do it. Very peaceful despite being super central. Easy access to buses. Views are incredible. Rooms are excellent value. Hosts are exceptionally accommodating. I give my highest recommendation to stay here! They had a cancellation in the honeymoon suit so they upgraded us for the night with no extra charge. They have the philosophy that it’s better to upgrade their guests for free when they can, than to leave the more expensive rooms unoccupied. The guests feel extra special and want to recommend the facilities to friends and also to return themselves. I couldn’t agree with their practices more!!! The views were amazing. The front desk was very helpful and knowledgeable. Location is in walking distances to restaurants and shopping. Lock in a great price for Nonis Apartments – rated 8.8 by recent guests! 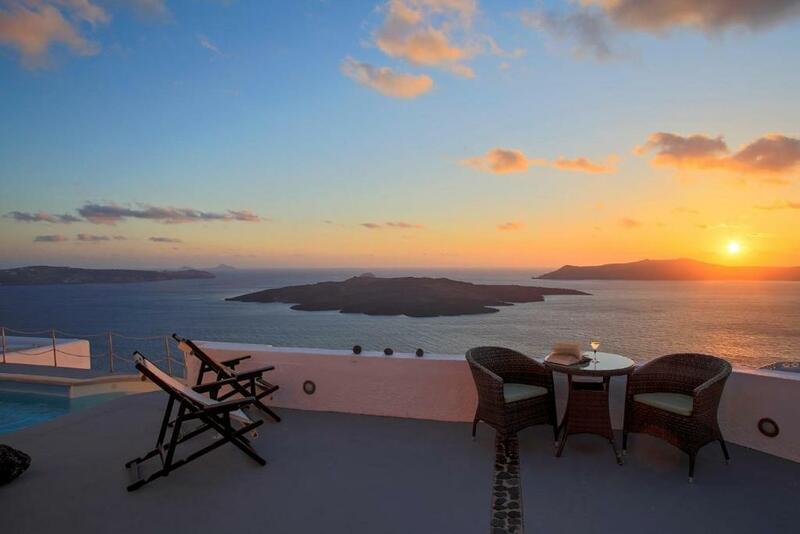 One of our top picks in Fira.On the caldera’s edge, this hotel features traditional Cycladic architecture and panoramic views of the volcano, the Aegean Sea and the famous Santorini sunsets. It features self-catered accommodations, a swimming pool and an outdoor hot tub. All air-conditioned units at the Noni’s are traditionally decorated. The kitchenettes have coffee-making facilities and fridges. All accommodations feature a cable LCD TV and a CD player. Many feature views of the volcano. A buffet breakfast is served daily. Nonis staff can provide travel information and arrange car and bike rentals. Free Wi-Fi access is available throughout the property. Apartments Noni’s are just 300 feet from the cathedral in the center of Fira. Shopping, taverns and bars are just minutes away. 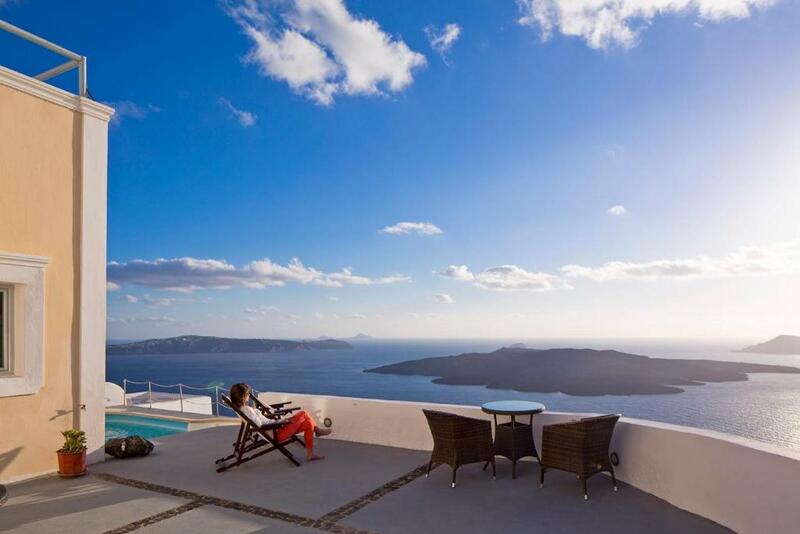 Santorini Port is 3 miles away and Santorini Airport is 2.5 miles away. When would you like to stay at Nonis Apartments? This air-conditioned room has a flat-screen TV and a kitchenette. Some rooms feature a balcony. This room features a sitting area. 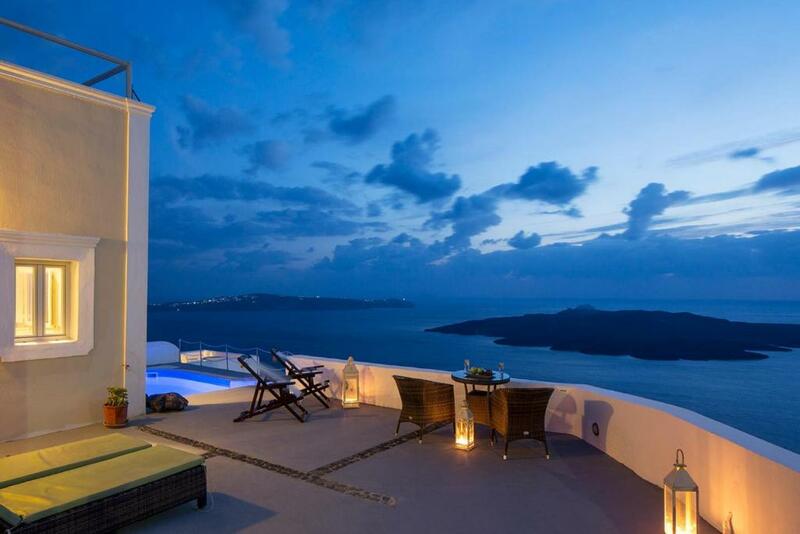 Some rooms include a balcony. Opening onto a balcony or terrace, this air-conditioned apartment is decorated in light colors. It has a kitchenette with a fridge and a teakettle. Noni's Apartments is situated in Fira at the edge of the Caldera cliffs. This beautifully appointed hotel features uninterrupted panoramic views of the Caldera, Volcano, Sunset and Aegean Sea. Built on different levels, it follows the traditional Cycladic style of the island Noni's Apartments has the perfect location since it is situated on the quietest part of the Caldera - although only 100 meters from the town center, it offers the tranquility you seek to fully unwind & relax while on holiday. Τhe main level of Nonis Apartments (in which located the most Apartments) does not have steps. Nonis Apartments is ideal for Couples, Families, Friends, Business Trip. The hotel is also ideal for Weddings, it has a plenty of space with four levels balconies, fantastic view to the volcanic islands and the Ocean. 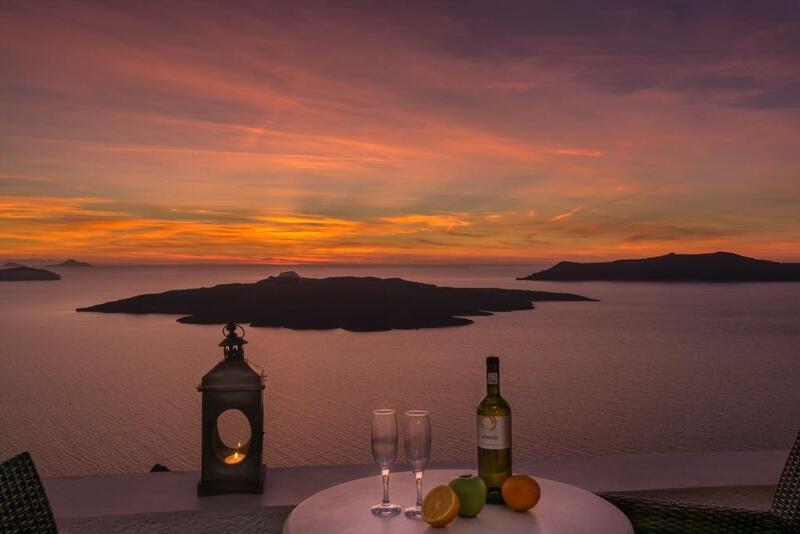 Your dream would come true at the magical caldera's sunset, our expiriensed staff will help as much as possible for the success of your unique event. The hotel is in a very quiet place only 150 meters from the center without steps. House Rules Nonis Apartments takes special requests – add in the next step! Nonis Apartments accepts these cards and reserves the right to temporarily hold an amount prior to arrival. Please inform Nonis Apartments of your expected arrival time in advance. You can use the Special Requests box when booking, or contact the property directly using the contact details in your confirmation. What a stunning place to stay! Santorini white buildings and paved laneways and magnificent views are all right here. Delicious Greek breakfasts delivered each morning with a courtesy call to our room that they were coming. Really spacious accommodation and friendly helpful staff with great suggestions for getting out and about. Their driver picked us up and returned us to the port so no donkeys or stairs for us! When we booked on booking.com we selected two adults and one infant, no cave room. But when we arrived there the owner said he didn’t see we have an infant on booking.com, and we were given a room with very small living area. We asked the manager if we could get another room and he was very inpatient and said will get us another room next day. On next day, he never showed up again not to mention changing rooms. Before we left we asked hotel service to get us a taxi as we had too much luggage. And they got us a small car instead of the usual full-size one you could normally see in the taxi station, but with the same price €20. The driver was so excited that he drove at 80 to 100 and kept overtaking all the time, where the speed signs say 50. He even turned back to tease my son so my husband had to remind him to slow down and be careful with driving. Maybe slippers in the room? Weird thing but our door was so hard to open. She couldn’t open it at all and my palms were getting bruised by the end of the trip. The apartment has less equipped with service devices such as electric kettle and air dryers. the location was very nice. Not worth for money . The bathroom was not good . There was water leakage . Water leakage from the window is a problem. Santorini is heavy in rain and strong in wind. The water pours from outside into my room and makes my room rather wet for periods of time. A wet room makes the stay less comfortable than it can be. I suggest the next renovation should well design on the setup and the control on engineering output should be improved for quality. The major pros: 1, a convenient location in Thira, just 5 mins walk to the center; and yet 2, it has good view from the living room over the volcano island. Good breakfast delivered to the room. Good host and location. The hot water in our room for some reason would last about 5 minutes then go cold. I’m not sure if it is the whole property that has this problem or the room itself but it was a bit annoying. Didn’t say anything because I thought it just needed to warm up considering it was only turned on as we walked in the room. Beautiful property. Friendly staff, so so helpful for us. George and his colleague and the cleaning lady. Lovely people. Went on a boat tour organised for us by George and his colleague. Helped us book airport transfer on departure which was very much appreciated. The facilities were good and location even better. 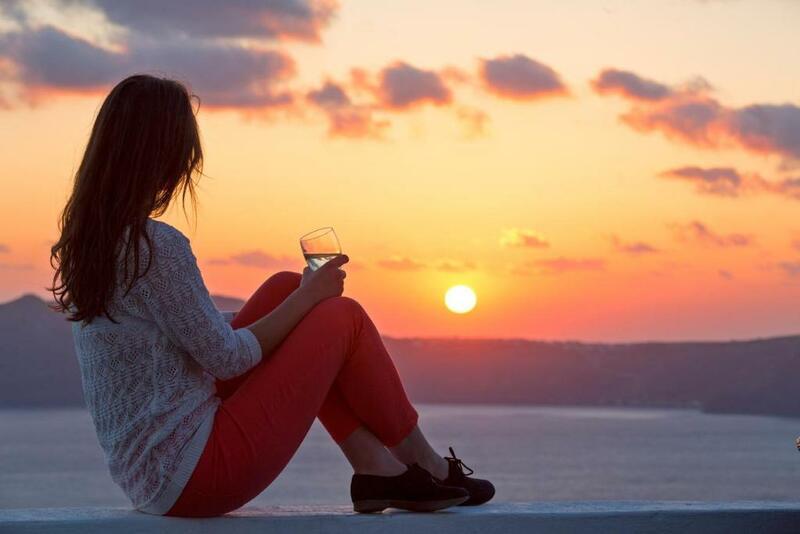 It has an amazing view of the sea and the sunset in the winter. Comfortable and nice spacious room. Would come back and stay in Summer next time. Staff (George) was amazing and very informative. Awesome staff and perfect location. The internet didn’t work properly after 1st day due to the weather.